One of the biggest questions that I seem to be chiming in on fairly often is how to prepare and get started with breastfeeding. As I’m only 3 months in, I’m definitely not the ultimate expert, but I have managed to breastfeed through the first six weeks, return to work, and increase my supply over time. Statistically that’s apparently when most women run into problems and are more likely to quit. But that’s another update to my original post that I’m working on now. How did I prepare for and get started? I’ll keep this short, simple, and numeric. The Womanly Art of Breastfeeding: The newest La Leche guide is a great resource that is organized very logically for the issues you will run into and when. It gets a little judgey in that it pushes exclusive breastfeeding to the extent of advocating taking leave from work, but seriously, just ignore that stuff. 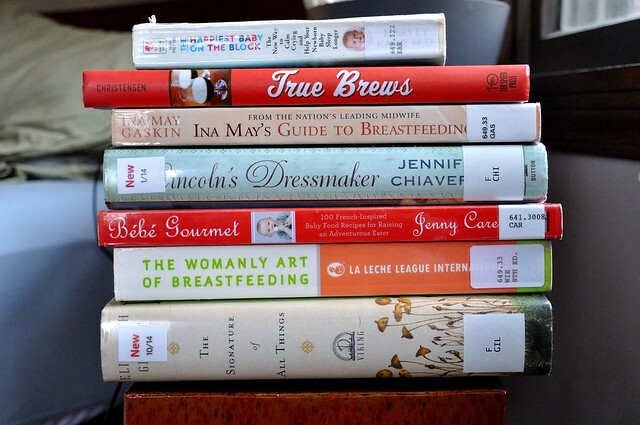 Ina May’s Guide to Breastfeeding: You really can’t go wrong with Ina May, and even though I didn’t find it as thorough as the La Leche guide, it’s a must-read. 2. I procured my breast pump several months before delivery. I won’t lie, I don’t know the specifics of the ACA and how it all comes down on coverage for breast pumps. I highly recommend contacting Aeroflow though. I received this tip from a coworker and contacted them and they did all the legwork in working through my insurance to find out what I qualified for. I ended up with a Medela In Style Advanced Starter and it’s been great so far. Nothing fancy, but solid and very portable. 3. I took a breastfeeding class and sought out professional people in advance. If you can, find a hospital that is designation a Baby-Friendly facility. It’s not simply a marketing gimmick but a designation given to hospitals who prioritize breastfeeding as the best way for a baby to receive their nutrients. Hospitals with this designation work to promote the best conditions for breastfeeding right from birth and often have more support than hospitals without the designation. My hospital had amazing lactation specialists. I started by taking their breastfeeding class, and when Kaitlan was born, attended several one-on-one follow-up sessions with another specialist in their clinics. 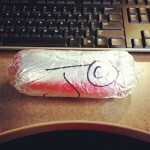 They also followed up and checked-in on me in the first month via phone and email. If you don’t have a hospital with this designation or support, make sure to include your wishes in your birth plan for the hospital. I highly recommend at least an hour of skin-to-skin contact immediately after birth to establish breastfeeding and plenty of rooming in. Our birth plan can be found here. 4. I set up shop before she was born, and adjusted as necessary to find a good routine. This one was actually less daunting than it sounds. I registered for supplies, received supplies, bought the rest, washed everything and created a breastfeeding/pumping/cleaning area in the living room and kitchen. It’s not aesthetically pleasing, and I’ve worked to minimize wherever possible, but there are only so many ways you can make your pump, Boon, drying mat, bottles, and brushes look good — and I use it too often to put it away and drag it out several times a day. Coupled with our mostly Paleo diet, our kitchen is CONSTANT activity. Boppy or My Brest Friend pillows: People have their preference as to which is best. 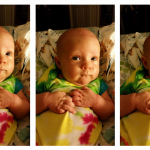 I love the versatility of our Boppy. Nursing bras: I typically wear these or sports bras, depending on the outfit. Nursing scarf: You can buy them, but they are super easy and inexpensive to make with this DIY. Options are always good right? Breast pads: I haven’t ended up needing these too awfully much, but they are super easy to make also. Boon Grass Countertop Drying Rack: I dry my parts, bottle heads and lines on this. Bottle Brush and Cleaning Brushes: Get both. Breastmilk cooler: If you’re working, this will be a lifesaver and carefully disguises your milk to look like everyone else’s lunch. Pick something that holds about three 5-oz bottles. Breastmilk storage bags: Seriously, the Target ones are the best bang for the buck. Toss in some Ziploc bags and you are ready to freeze milk. Here is a great post with some tips and the method I use. 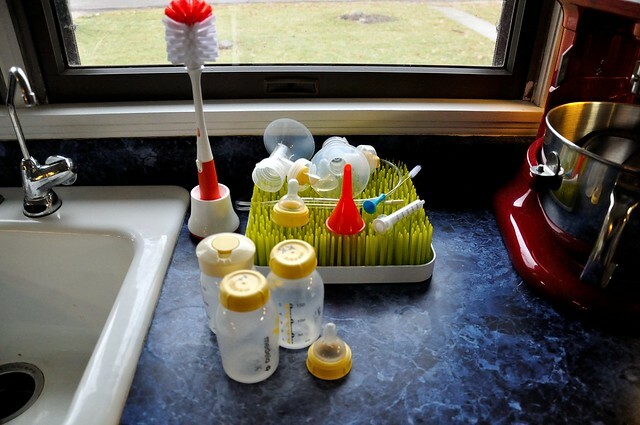 Bottles: Your selection will largely be determined by your baby’s preference. 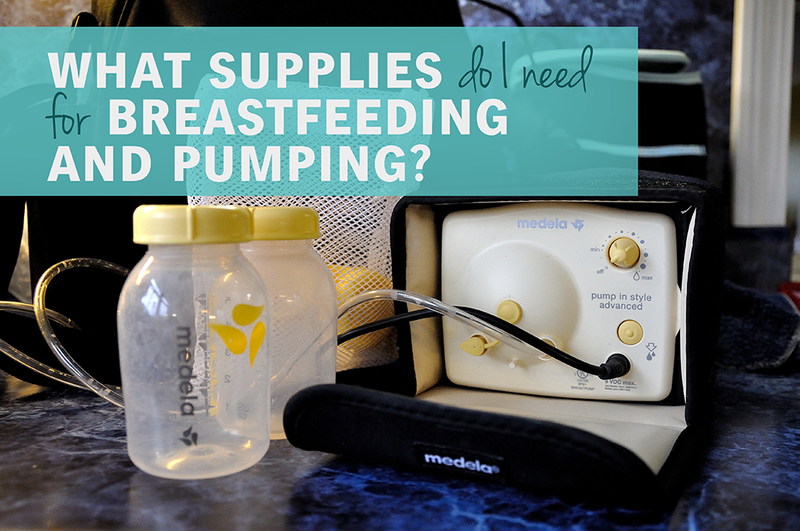 I’m currently using Medela because they work and go with all my pumping supplies. I also might pick up some Dr. Brown’s to have when we size up as well. 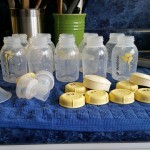 For Medela, I’ve registered for and have really liked this set with the bottles with date caps and a storage bin. You can buy the lids separately as well. I also recommend picking up some spare parts. Other misc. supplies (not required but helpful): Small funnel, baby wipes, dish soap, Ziploc bags, stock pot/small bowl. I clean pump parts with soap or bottle wipes after every use and sanitize by boiling either before bed or after my morning pump (around 5am). Typically I just pull out our stock pot, fill it with hot soapy water, soak and then scrub everything, rinse and refill the pot with clean water and put everything back in and bring to boiling on the stove. This allows me to always have clean and dry parts and bottles for use. I pull the bottles out while they are still pretty hot and they dry perfectly. 5. Read up on the breast milk storage guidelines. Read up on the guidelines in advance, as well as tips for heating and storing milk. You don’t want to lose a single drop of milk if you don’t have to. These are the main areas to focus on before giving birth. Having at least a base level of knowledge, support and equipment made troubleshooting once she got here much easier. I won’t lie though, preparing to transition back to work wasn’t easy, which is why Part 2 will focus on the transition back to work. Stay tuned! I do like the La Leche League book. 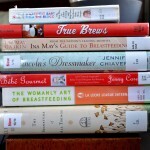 I didn’t prep much at all prior to giving birth, and I wish I had read that book before hand. 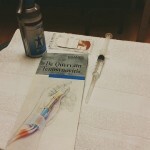 We worked things out, but I (and our kid) probably had a more frustrating experience than needed. We don’t have hardly any counter space, so we bought a wall-mounted rack from Ikea that has a drying rack that hangs from it. That’s where we keep all the bottle supplies, and it’s worked well for us.